Sometime that beautiful candid photo can do with a little wow factor, so the feature photo here has received a stripping back the colour treatment. Photo opportunities present themselves everywhere. I attended a family wedding, at a lovely venue, and being family, not the primary photographer, I managed to sneak a few candid shots. in the feature photo I stripped back the colour in the back ground to create a high contrast photo. This photo really symbolised the great day we had, with the Bride and Groom at the centre of attention. The original photo was very nice, but the colours of the guest outfits made the couple blend in. I tried increasing the contrast, but that did not work as I wanted. So I started experimenting with stripping back the colour. The result was a stunning photo, that I am proud to hang on my wall. This option is not suitable for most photos, but every now and again it can create a truly spectacular photo from a really great photo. 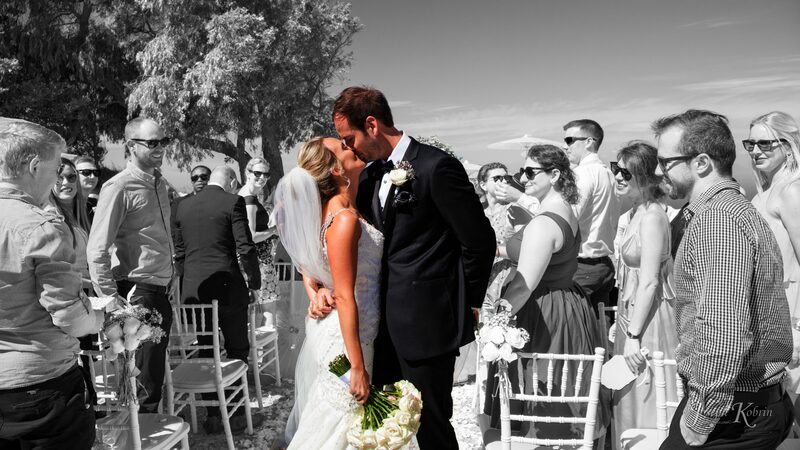 Making the back ground black and white works to focus your attention on the bridal couple.